Beautiful and practical, ENERGY STAR® certified windows can increase the energy efficiency of your home and save you money on utility bills. They also reduce condensation, decrease outside noise, protect furniture from sun damage, and can provide increased temperature regulation during summer and winter (for more information, see why is it important to select the right windows for my home?). Low-emissivity (low-E) coating reduces the ability of heat to pass through them preventing heat from escaping your home in the winter and keeping cooler air in your home in the summer. Double or triple glazing improves efficiency while reducing exterior noise. 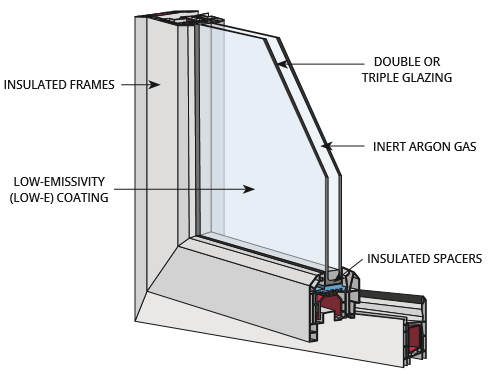 Inert argon gas between the window panes prevents heat transfer and minimizes condensation. Insulated spacers and frames also prevent heat loss.